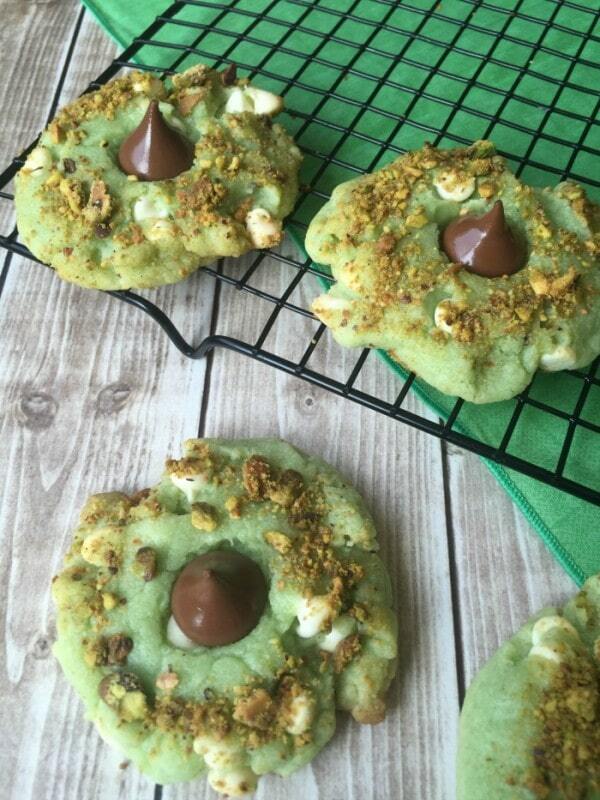 Here is a pistachio cookie recipe that is the perfect color for St. Patrick’s Day. Pistachio cookies are one of my favorite cookies. My aunt makes her own pistachio cookie recipe every year for Christmas, and they are amazing. These cookies are easy to make. You just doctor up a sugar cookie mix to make an extra delicious and green colored cookie that looks like it was baked by a leprechaun. Or an elf, depending on the time of year. 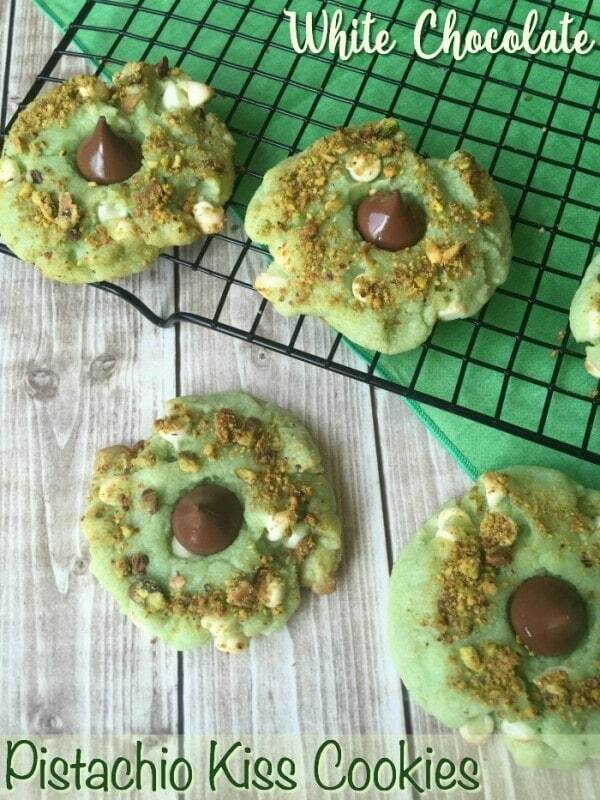 The light pistachio flavor of these cookies are perfect all year round. In a mixing bowl, add the cookie mix, pudding mix, and flour. Stir to combine. Add softened butter and eggs and mix well. Dough will be stiff. Pour chopped pistachios onto a plate. Shape the cookie dough into 2 inch balls and then flatten slightly with the bottom of a glass. Dip the edges of each cookie into the chopped pistachios. Place on cookie sheet and bake for 8-9 minutes. 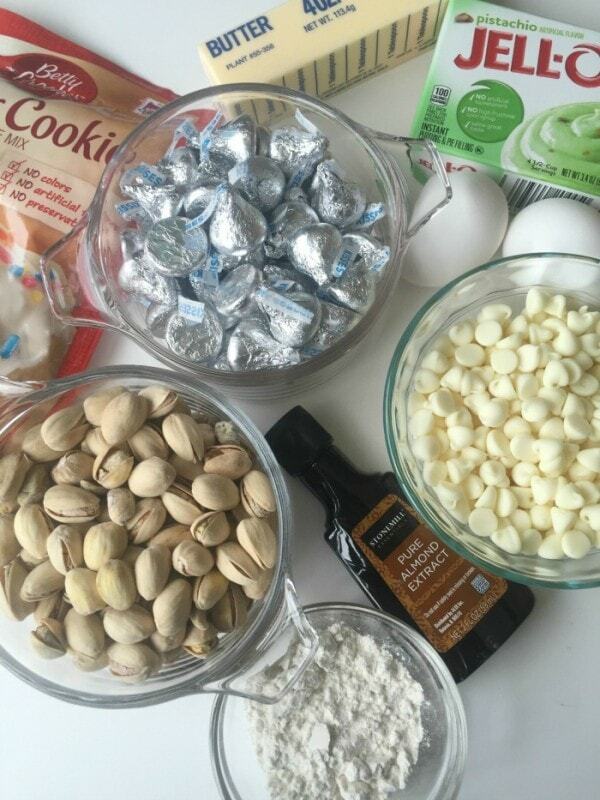 (If you bake longer, the white chocolate chips will turn brown). Let cookies remain on cookie sheet for 5 minutes before transferring to a wire rack. Gently press a Hershey kiss into the middle of each cookie. Transfer to wire rack to let cool for 20 minutes. **You can store these cookies in an airtight container for up to one month. Not that these cookies are at all healthy, but pistachios have a good amount of Vitamin B6, fiber, and protein which makes them a valuable addition to your diet. Did you know that pistachios are actually a seed, not a nut? 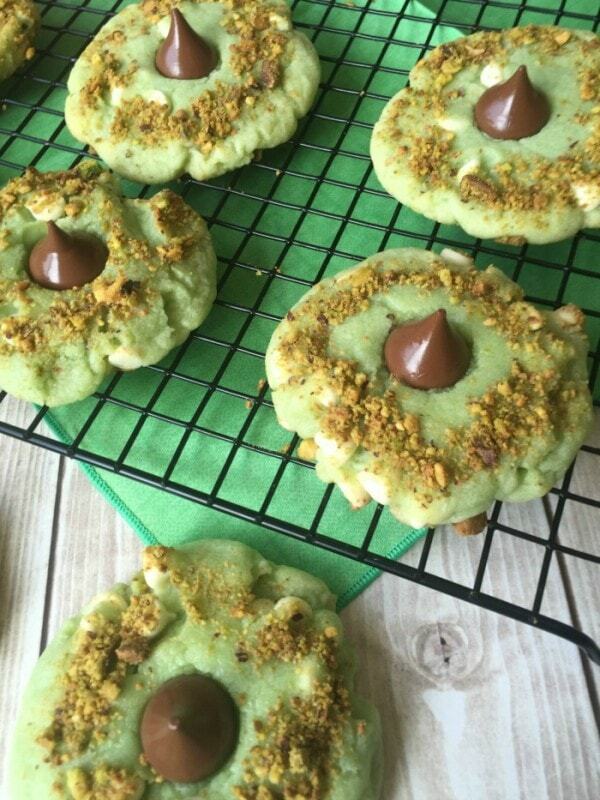 Green cookies for St. Patrick's Day, Christmas, or any day at all. 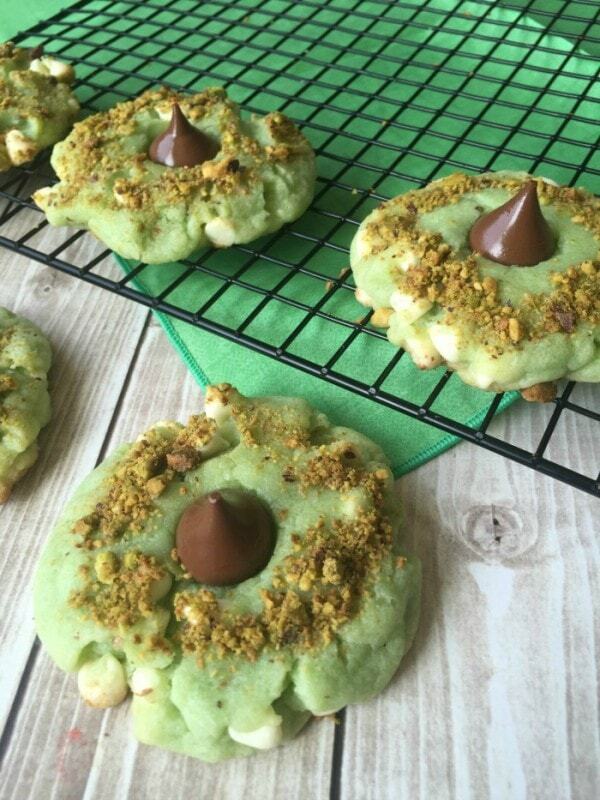 These delicious pistachio cookies with a kiss in the middle are sure to please all year round. 1 box Jello pistachio instant pudding 3.4 oz. 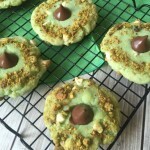 Have you ever tried a pistachio cookie recipe? I love pistachios and know they are good for you! I enjoy them any way I can. 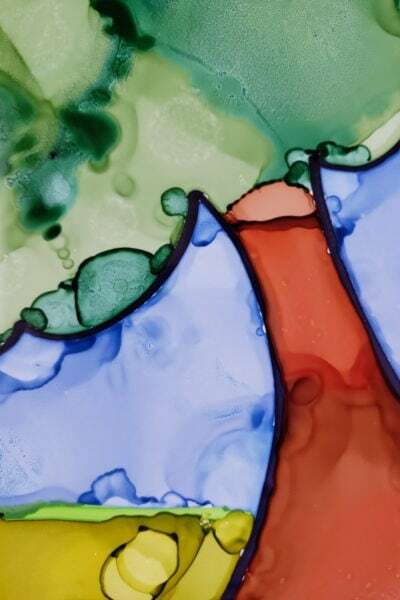 This is a wonderful recipe and I did put it on Pinterest! It’s good that these would keep for a month. Can make them when I have time and they’ll be ready for St. Pat’s day. 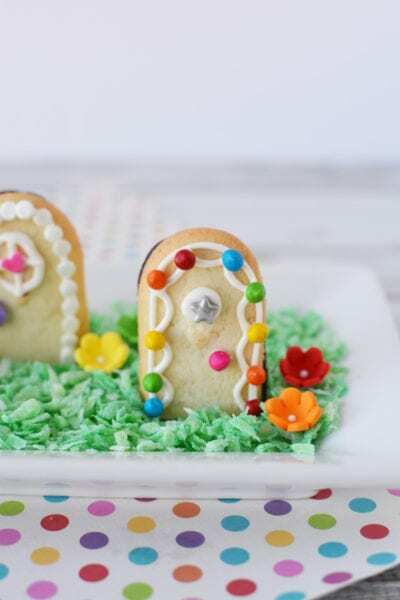 Every Easter I am in charged of all the cookie baking in my huge, extended family and I will definitely be adding this recipe to my list of usuals! I am a huge pistachio fan and with the addition of white chocolate, this is the perfect cookie to me! I also love that they are that unique color, sure to stand out and be a hit at our holiday dessert table! Just in time for St. Patrick’s Day. 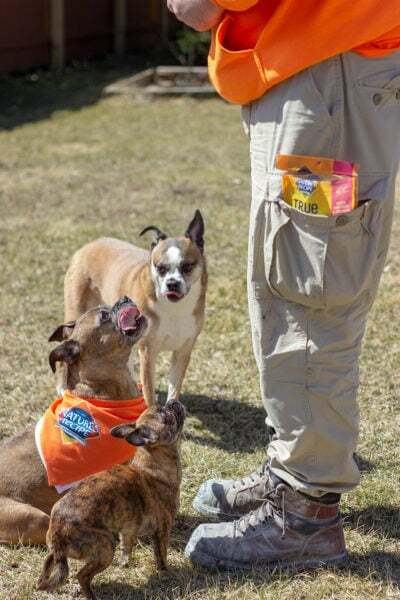 Pistachios are one of my favorite nuts, I like to eat them during my kids’ baseball games as it helps me to stay grounded! 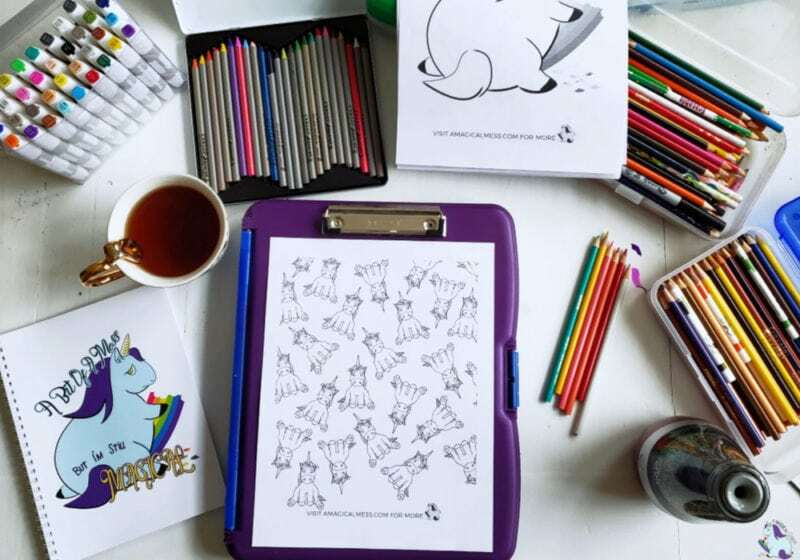 Oh wow, they look wonderful! Pinned it, to remind me to make these lish looking cookies soon! Thanks! 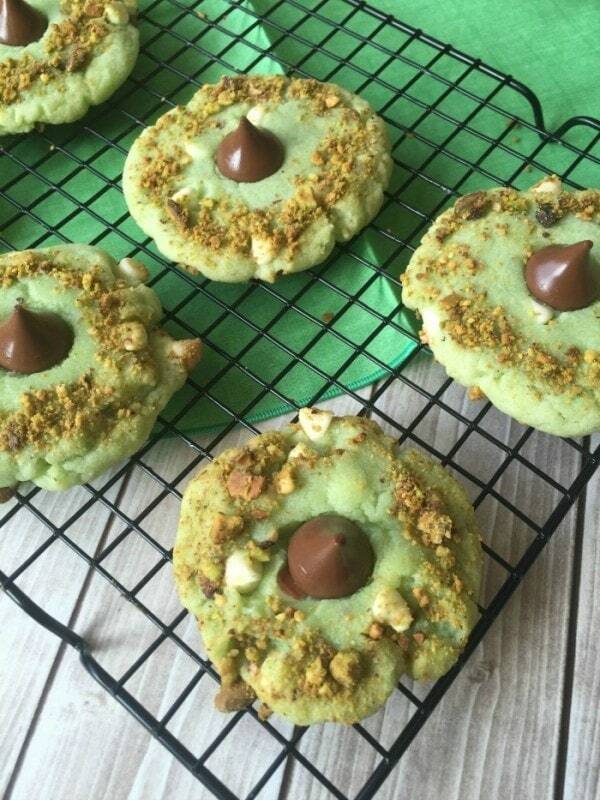 My husband is a freak over pistachios and I have been looking for a good treat to make him using them and I think I’ve found it! 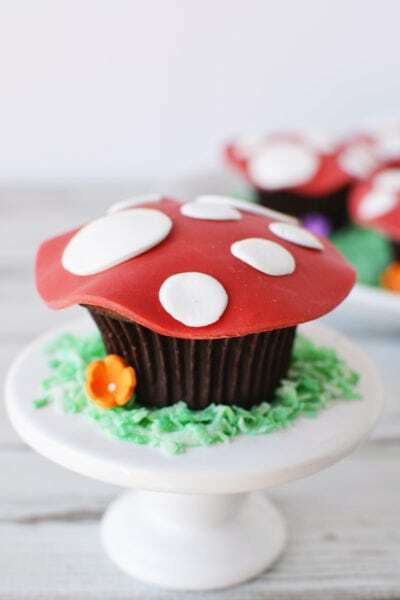 Too cute and yummy! Thanks for linking up with Delicious Dishes Recipe Party! This is such a unique cookie idea and they look deliciuos!